If you have a broken leg, moving around becomes a challenge. You can either confine yourself to a wheelchair which can get you around but is bulky, or you could go with a pair of crutches which can be hard to maneuver. There is also a third option known as a broken leg scooter that makes mobility easier for anyone recovering from leg injuries. 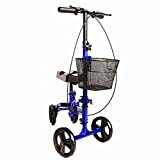 These scooters are safe, comfortable and the perfect substitute for crutches and engineered specifically for weight-bearing relief. In design, leg scooters are similar to a scooter and have a padded platform that can be used to rest the knees. The broken leg scooter is designed in a way that it can help you keep your balance. As compared to a traditional crutch, leg scooters work more effectively and can speed up the recovery and healing process. The impressive benefits of using a leg scooter include safety, speed and perfect foot elevation. For starters, the broken leg scooter is definitely safer than crutches as it doesn’t put the body in a strained position. 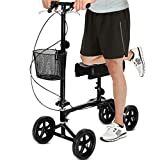 Unlike crutches which can cause you to strain your shoulder and back muscles, the leg scooter protects your body from any undue pressure. There is less need to practice caution as the scooter is fairly self-supportive whereas crutches need to be held correctly to prevent any falls. In terms of speed, broken leg scooters have a definite advantage as they allow you to move fairly quickly and over an array of surfaces. There is no need to be concerned on how you will get places as these scooters come with a large pair of wheels that work really well on different surfaces. And finally, scooters provide ideal foot elevation in a comfortable position. Riding in this position means no risk of future injury while maintaining balance no matter how you use it. However, broken leg scooters are only good for use on leveled land so if you wish to get upstairs, they can’t allow you to do so. This device is also definitely more expensive than crutches and requires practice on its usage. Also unlike crutches, these scooters can take up space and are much heavier. This broken leg scooter is perfect for anyone suffering from sprains or similar leg injuries. The scooter is comfortable for use and even comes with an added storage compartment. It can support up to 300 pounds in weight and provides ample knee cushioning. For support and stability, the product comes with an 8-inch polyurethane wheel to make sure you don’t lose control. This scooter is lightweight and can be adjusted to provide a relaxing result. Fold points allow the scooter to be folded and stored. A detachable bag is also provided to provide all kind of necessary convenience. The product is perfect for use both indoor and outdoor; it is easy to assemble and doesn’t allow too much stress to be put on the legs. Customers who have used this broken leg scooter have found it useful for indoor use and have listed it as a high-quality product that provides independence as well as safety. Customers have also found the product easy to assemble and appreciated the comfortable seating platform along with brakes. They have said that it does justice to the purpose it is designed for by meeting all requirements. This scooter is suitable for use on all kinds of terrain and provides comfort sidewise. Whether you are at work, at your house or anywhere else, this product is suitable for use everywhere. This broken leg scooter comes with integrated shock technology and 12-inch tires that make sure the most comfortable ride is provided. It is designed in a way to provide stability and sturdiness and can support up to 350 pounds. Despite being lightweight this product is made from a heavy aluminum bar that is responsible for making the product strong and making sure that all met safety measures are met. Customers who have used this broken leg scooter have found it to be reliable and appreciated the excellent and heavy frame used. Another feature well appreciated are the large wheels that make it easier to move on all types of terrain. With the use of this product, customers have found it very easy to travel around as the product ensures stability at all times. The kneepad is also comfortable providing safety and comfort at the same time. Another well liked broken leg scooter is the Knee Walker by Health Line Products. This model comes with an adjustable steering and adjustable knee cushion. Other added features of the product include a removable basket and non-scruff wheels along with brakes that can be locked. The scooter has been designed with advanced brake options that can slow down the wheels using a single brake lever. The scooter also has a parking lock brake feature that allows the user to set the brakes. This feature helps provide an overall comfortable experience to all those using it. This scooter can support up to 300 pounds and is constructed using steel to provide the strength required. Customers who have used the product have found it to be very useful and durable. They have appreciated the additional basket that comes along and the folding ability of the product which makes it easier to carry. They have also praised the mobility this product provides and easier to use for indoor purposes. The product has a disc brake system which is a plus point customers have pointed out. This broken leg scooter holds the advantage that it is foldable and perfect for everyone who has sustained leg injuries. The foldable feature makes it easier for the product to be folded, stored thereby allowing saving on space and making it easier to carry around. The contoured channel is another feature that allows the leg to be fit comfortably and safely. The scooter is designed to provide a comfortable experience and has two locking handbrakes that can control disc brakes. Depending on the figure of the person, the height of the seat and handlebar can be adjusted. The scooter comes with a steel frame for safety purpose and for durability. The product is suitable for indoor/outdoor purposes and easy to assemble. Customers who have used the product have found it to be reasonably priced and a product that is useful for both indoor/outdoor uses. Users have listed the product as a high-quality product that increases mobility and fulfills all requirements that a person with leg injury may require. This broken leg scooter is the most economical way to move around as it provides all the support required by all those who have leg injuries. It comes with handlebars and frames along with the ability to fold which makes it easier to carry. The height of the padded knee platform and handlebar can be adjusted according to body requirement. The product despite being lightweight can support up to 300 pounds. A detachable storage basket is provided with the scooter allowing the user to carry important things along, freeing and eliminating the need for use of hands. Customers who have used the product have found the product useful and like the lightweight design of the model along with the folding ability. They have labeled the product as a “Great transporter” and perfect for indoor/outdoor use. Customers appreciate the ability of the product to be easily carried and transported and have compared it to a wheelchair which is heavier and difficult to carry around. They also have talked about how the product is perfectly priced and easy to assemble. These are some of the best broken leg scooters available in the market that are useful in helping all those with leg injuries to move around. Other than those with leg injuries, these scooters are also an aid for people with diabetes and other diseases that may limit a person’s mobility.